CHICAGO -- The flight of American Trans Air's (ATA) US$100 million training center is still running on schedule for its Chicago arrival. Originally announced in late January of 2001, the 200,000-sq.-ft. (18,000-sq.-m.) center's fate became fuzzy in the aftermath of Sept. 11's terrorist attacks. Like most airlines, ATA has taken an economic hit from the reduction in air travel in Sept. 11's wake. Since the attacks, the Indianapolis-based airline has laid off some 1,500 of its 7,800 employees. 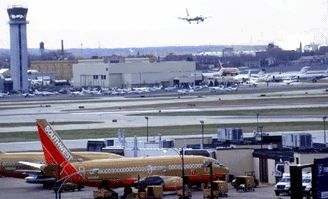 ATA represents 25 percent of operations at Midway Airport (pictured above). The $761 million Midway Terminal Development Program that's now under way is the largest public works project in progress in Illinois. American Trans Air, however, announced in October that the training center near Midway Airport was still a go. "We do intend to move forward with our initial plan" for the training center, said ATA President and CEO John Tague. "It will improve our financial situation. It makes good economic sense." ATA's intentions for the training center further solidified in December: The airline's application was approved for a zoning change for the site it has chosen just south of Midway Airport on Cicero Ave. Chicago's City Council is expected to give the project final approval. ATA's plans call for building four-story and two-and-a-half-story facilities. The training operation will employ 110 workers. Portland, Ore.-based CF Properties currently owns the site, which was formerly a motor freight terminal. Under the current proposal that will go before the City Council, ATA would buy the land from CF Properties. The airline, however, would then deed the property to the Chicago Dept. of Aviation (CDA). At that point, CDA would lease 23.1 acres (9.2 hectares) to ATA. The airline, however, will initially utilize only 17.4 acres (seven hectares) of that site. But ATA will have the option to sublease 5.5 acres (2.2 hectares) to a hotel/retail developer. The CDA would retain the tract's other 3.5 acres (1.4 hectares) for parking. The center for training pilots, flight attendants and mechanics will be the first such facility for ATA. The company currently outsources its training programs to other airlines. The Cicero Ave. center, which will also be the first such facility in Chicago, will include two General Electric flight simulators. The simulators will be positioned behind clear glass and will be visible from Cicero Ave. The GE simulators will be used to train ATA pilots in flying the airline's new and larger Boeing 737 and 757 aircraft. The 737s and 757s are replacing the Boeing 727s that ATA is phasing out of its operations. The second largest carrier at Midway, ATA represents 25 percent of the Chicago airport's operations. Part of ATA's cost cutting after Sept. 11 has included canceling 20 percent of the airline's flights from Midway. ATA, however, has announced plans to again ramp up its flight schedule from Midway. Tague has said that the airline will return to a schedule "similar to pre-attack . . . no later than January." The training center is part of the airline's continuation of the plan it earlier announced to increase its Chicago-area employees to 4,800 over the next five years, company officials said. ATA has employed as many as 2,500 workers in the Chicago area. The 11th largest U.S. airline, ATA increased its total employment by 11.4 percent during 2000. 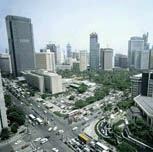 MIGA has issued $87 million in investment guarantees for a project to improve transportation efficiency and reduce exhaust-fume pollution in Manila. WASHINGTON, D.C. -- While it's not the usual fare for "Project Watch," it is news that indicates that a lot of international expansion projects will continue, current uncertainties notwithstanding. That news comes from the recently released "Global Business Location Study," which was conducted by the Multilateral Investment Guarantee Agency (MIGA) of the World Bank, with the assistance of Deloitte &mp; Touche LLP. The study of 191 responding firms' foreign expansion plans revealed that many of those growth initiatives have not been inhibited by either Sept. 11's terrorist attacks or the downturn in the global economy. "Companies usually look at foreign expansion as part of a long-range plan, Karin Millett, director of MIGA's Investment Marketing Services, said in reviewing the survey results. "And, even though we've experienced terrible unrest in the world during the past few months, businesses are generally not deterred. They realize that to remain successful, they have to pursue their long-term goals." The crux of the study's significance lies in two separate MIGA studies: one conducted during July and August 2001 and a follow-up survey that was administered "after Sept. 11," according to MIGA. The July-August study found that more than 80 percent of companies intended to expand globally in the next three years. The follow-up study found that roughly two-thirds - 64 percent - of those same companies were proceeding with facility expansion plans despite the terrorist attacks and sluggish economic conditions. The survey respondents included some of the largest multinational corporations. Together, those companies have aggregate annual sales of nearly $2 trillion, according to MIGA officials. Millett said that MIGA's survey indicated that a sizable portion of the planned global expansions will go to nations not normally listed among the world's economic powerhouses. "This is good news for emerging economies and developing countries," said Millett, "as they account for more than half of the leading locations for investment, based upon the survey results." Washington, D.C.-based MIGA was created in 1988 as a member of the World Bank Group to promote foreign direct investment into emerging economies. MIGA offers political risk insurance to investors and lenders and helps developing nations attract and retain private investment. Airbus engineers in Wichita will work on the new A380 super jumbo aircraft (pictured above in a mockup). The company is billing the A380 as having 49 percent more available floor space, but only 35 percent more seating; 15 to 20 percent lower operating costs than the largest aircraft flying today; and 10 to 15 percent more range. WICHITA, Kan. -- European consortium Airbus has dropped a new facility into an aircraft hotbed, Wichita, Kan. The new operation's total announced employment - 60 workers - is comparatively small. The jobs, however, are on the high end of the scale. Airbus's new Wichita facility will be a wing design and engineering operation; the staff will be comprised of structural and stress engineers. In addition, the engineers in the new Wichita facility will be working on a major new Airbus product: the A380, the company's new super jumbo aircraft. Airbus officials are billing the aircraft as a quantum leap forward in the airline industry. The A380, they say, will have 49 percent more available floor space, but only 35 percent more seating; 15 to 20 percent lower operating costs than the largest aircraft flying today; and 10 to 15 percent more range. Wichita, which bills itself as "the air capital," obviously had the labor pool and infrastructure to support an aircraft operation. The city boasts an existing base of more than 40,000 aerospace employees, who work for the likes of Boeing, Cessna, Raytheon and Bombardier. Fully one-third of the Wichita's income is related to aircraft manufacturing. Kansas Lt. Gov. Gary Sherrer cited Wichita's massive aircraft cluster and the quality of the city's aviation engineers as major factors in attracting Airbus. The project also marks a payoff for the state's European recruiting efforts, he added. "This decision by Airbus shows that our campaign to attract European aerospace companies to Kansas is producing dividends," Sherrer said. "Through our European office in Surrey [England], Kansas Gov. Bill Graves and I have led major delegations to the international air shows in Farnborough and Paris over the past couple of years. We have entered into exchange agreements with several industry bodies, such as the UK's North West Aerospace Alliance and the Paris-Ile-de-France Chamber of Commerce. "We have found that many European suppliers, especially in the UK and France, are ready to set up design, assembly or customer service centers in Kansas to take advantage of the unrivalled skills base here," he added. Another factor played a role in Airbus's decision to enter Wichita's air cluster, said officials for world's second largest commercial aircraft maker: the city's location in the U.S. Central Time Zone. The time difference between the Wichita facility and Airbus's wing design and engineering facility in the UK will facilitate around-the-clock work in developing the wing for the A380, company officials said. Airbus already has what company officials called "firm commitments" from eight customers for 67 A380s. The A380 family of aircraft starts with a "baseline" model, the A380-800, which has a 555-passenger capacity and a range of up to 8,000 nautical miles (14,816 km.). The freighter version, the A380-800F, has a payload capacity of 330,000 pounds (148,500 kg.) and a range of up to 5,600 nautical miles (10,371 km.). Seventeen of the 67 total A380 orders secured thus far are for the freighter version, company officials said. The A380 family of aircraft will also feature lower fuel burn, less noise and lower emissions, they added. pw1231bpw1231b ©2002 Conway Data, Inc. All rights reserved. Data is from many sources and is not warranted to be accurate or current.